Text neck syndrome is no joke. Research suggests that smartphones users spent an average of four hours a day staring at their device, resulting in up to 1,400 hours a year of excess stresses on the cervical spine. 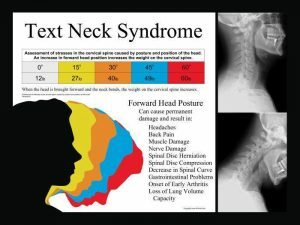 Although the average head weighs between 10 and 12 lbs, the weight on the neck can increase to 26 lbs at a 15-degree angle and 60 lbs at 60 degrees. This dramatic increase stresses the neck and shoulder muscles and may lead to headache, tingling in the arms, poor posture, decreased lung inhalation and even degeneration and bone spurring of the cervical spine. Teenagers are usually the worst offenders! If you’re noticing that your teen is slumped over and looks like he or she may be melting right into the floor, it’s a great time to get a spinal check up! If your head and neck look like a turtle sticking its head out of a shell, it is definitely a sign that you have lost the forward banana shaped curve that you are supposed to have in order to support the weight of your head. Tired of your neck hump ladies? GREAT NEWS! Just as gravity has slowly and surely been pushing your head forward, chiropractic can help you to regain your posture and train your spine back into the right position! Call our office at (808) 388-7682 for Dr. Cassy or (808) 425-7092 for Dr. Ricky to come in for a complimentary consultation and a set of free posture photos with measurements. Don’t wait! Measure now, and be amazed at how much taller you feel after your spinal alignment.